Barg o bār : Manẓariyah naẓmen̲ : chaṭā majmūʻah kalām, 1960 tā 1973 / Salām Sandīlvī. From the University of Chicago Library. برگ و بار Barg O Bar by سلام سندیلوی Salam Sandilvi. I believe Barg O Bar means “fruits and leaves”? What a lovely, simple floral treatment of Urdu letter shapes. I like it quite a lot! Even though the three floral motifs are quite different in style, I like the way they are patch-worked together on this cover. 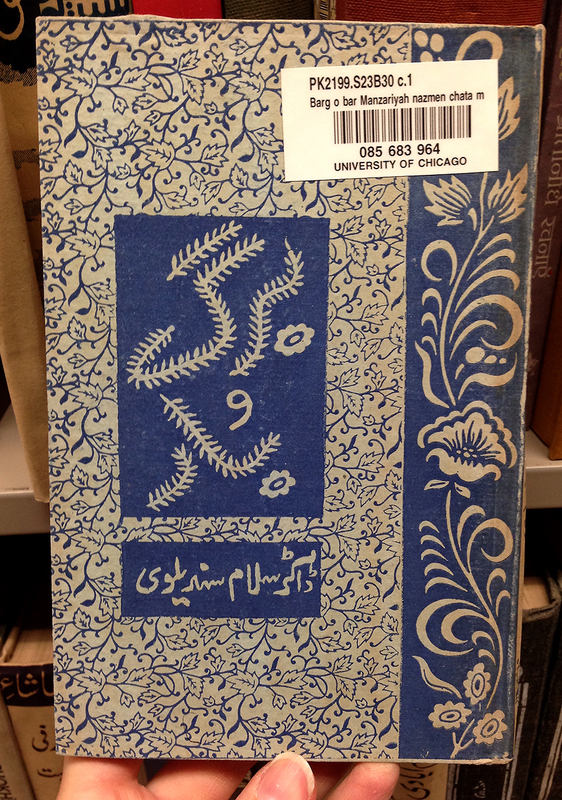 I wish that the Library hadn’t put the barcodes on the *front* of the Urdu books. Darn! Barg o bar could be same as Bagh o Bagh, which loosely means garden garden or lush garden.